Over 5,000+ Copies Downloaded + Amazing Reviews! NOTE: The video above shows SpyBar v2.9.1 - fully compatible with the latest Chrome & Firefox browser versions on Chrome & Mac. Your license allows for use on all of your personal devices. Rob Cornish here and welcome to SpyBar. I’m sure you’ll agree that over the past few years WordPress has transformed the way websites are built. Gone are the days of thousands of dollars spent on web design or frustrating days spent coding complex HTML. The best thing about WordPress is the amazing array of Themes and Plugins that have been developed – many of which are completely free! In fact, this is one of the reasons it has become so incredibly popular – there are currently over 57 MILLION WordPress sites in the world and this is growing every day. The list goes on and on and the rate of development of new and exciting Themes and Plugins is increasing all the time. know you are using the BEST available? One way is to read to forums, blogs and newsletters to keep up to date. You can search around Google, use different services both free and paid. You can download expensive software which you have to boot up every time you want an answer. You can even ask your marketing acquaintances. Here’s a MUCH easier way…. Seen a cool feature or gadget on a site and wondered how you can do the same? Found an attractive site design and wanted to know the theme? Wanted to quickly see the backlinks to a top ranking site WITHOUT having to use expensive and cumbersome software? Wondered which Autoresponder service a particular marketer or website is using? Needed WhoIs information for direct contact with the owner for affiliate or JV deals? SpyBar does ALL of these things at the touch of a button and it does them in ONE place – right inside your web browser! SpyBar is a powerful browser extension for Google Chrome and Mozilla Firefox. Your SpyBar licence is compatible with your PC and Mac and valid on all your personal devices. Exciting new Wordpress Themes and Plugins are released all the time. In just one click SpyBar will INSTANTLY give you a list of these for any WordPress website. So now you can “spy” on the latest WordPress tools that the gurus, leaders and competitors in your niche are using! Stop wasting money and time switching between expensive desktop software, “analysis” websites and cumbersome project profiles. SpyBar eliminates this and it doesn’t even clutter up your browser – it sits conveniently and discretely as ONE icon on your browser toolbar ready and waiting whenever you need it! SpyBar doesn’t draw from a static database of known WordPress tools. Instead it dynamically detects them. This means you’ll get instant results on exciting and brand new themes and plugins the minute they are installed on the site. Ever wondered what other websites a company, business or marketer owns? Well, provided they are on the same server and IP address (often the case) you can discover this in just two clicks of your mouse! As you know some of the most valuable content is stored in PDF files rather than on web pages. In just two clicks SpyBar will conduct a search for all PDF files stored on the site you are currently visiting. Similarly, you can use the "Search" option which will list every page on the site identifiable to Google. A huge time saver! Want to know more about what SpyBar has uncovered for you? No problem! All the results that SpyBar gives are linked, so in just one click you’ve got a Google search results page (in a new tab, of course) where you can see the product website, user reviews and even recommendations for other similar WordPress Tools. WhoIs information is very handy for finding the contact details of the owner of a website. SpyBar links you directly with this information so you can find guest posting, interview, affiliate and joint venture opportunities! Discovering new tools is great but success requires action taking. One of the most effective ways of doing this is to use the famous "Pomodoro Technique" (TM). Start a new 25 minute work session by clicking the link on SpyBar. Get it done and move forward in your business! According to WordPress.Org there are now over 57 MILLION WordPress sites in the world. How many have Themes, Plugins and backlinks which would massively boost your business but you just don’t know about them? Not only is Spybar compatible with Firefox and Chrome (Google Webstore approved), your license will allow you to use it on your PC and Mac. Fully Tested and Compatible with the Latest Versions of Google Chrome, Mozilla Firefox, PC and Mac! 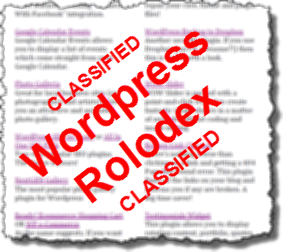 The WordPress Rolodex is a list of the 18 Wordpress themes and plugins I use in my business. If you’ve purchased my products before then you’ll know I aim to give the best customer service in the industry. If, at any time during the first 30 days, you aren’t thrilled with SpyBar, you’ll receive a full refund. And you can also keep SpyBar and other materials that are waiting for you inside the Members’ Area! You have complete peace of mind and nothing to lose - the risk is ALL on me, as it should be. Take action now and I look forward to seeing you inside the SpyBar Members’ Area. P.S. Remember this is 100% risk-free you’ve got NOTHING to lose and everything to gain!